Surface Winding Slitting Machine(FSL-BT) - HCI Converting Equipment Co., Ltd.
Lift-up & floating type unwind stand with 3" air shaft. The tension is sensed by load cell sensor and compared to the set tension. Pneumatic nip rubber roller: providing perfect tension isolation. Razor cutting in the groove roller method. 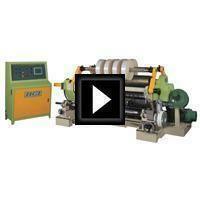 Equipped with trim reject fan and left/right moving type trim winder. Two independent motors controlled each rewinding shaft for the most accurate tension output. Rewinding diameter feedback system assures extremely stable rewinding tension without the need to adjust the tension according to speed and diameter variables. Rewind shafts auto ascent/ descent mechanism help heavy rolls unloading. Unwind auto stop and material exhausted stop.